I love farmers’ markets. I love the fresh produce and the carnival atmosphere. I love supporting the local economy and meeting and networking with the people I meet at the market. Unfortunately, here in eastern Kentucky, fresh locally grown produce won’t be available for several months yet. But I was able to get some networking and storytelling in recently with my farmers’ market friends when the leadership of three eastern Kentucky farmers’ markets held their first vendor training sessions. Farmers know that if you want to have tomatoes to sell in June, you better seed them in February. And farmers’ markets that want to be successful need to start planning way before opening day too. That’s why, on a slightly sunny Saturday morning in late January, the Perry County Farmers’ Market held their Winter Farmers’ Market Meeting. The Perry County Farmers’ Market is supervised by the non-profit Northfork Local Foods through the work of Market Manager Emily Whitaker, Board Chair Jennifer Weeber and CFA Farm to Table Associate, Carolyn Davis, each of whom took a workshop focus. Next, Jennifer led a market business session on fees, location, dates, certifications, that sort of thing. Two issues that have come up frequently over the last couple of years in Perry County are resale, the selling of products not grown by the seller themselves, and smoking at the park shelters where the market is held. As you can imagine, the discussions were lively but, it is exactly these opportunities to bring potential issues to the entire group that make for successful operations. Emily led the last session, a discussion on who was growing what for the 2018 market season. After writing down everything called out, the group looked for what was not on the list yet and should be. “Mushrooms” someone said to a mummer of agreement and they got added to the list. The session ended with a very long list and several commitments to have spring greens, seeds, veggie starts, crafts and honey available for a May opening date. More and more farmers’ markets are requiring that their vendors become certified in PBPT to assure that the produce that is being sold to customers is healthy and safe. The training teaches farmers and gardeners how to grow, harvest and wash produce to avoid contamination from soil borne pathogens. The training teaches the safe ways to apply fertilizers, chemical and natural, the safe way to clean produce for transport and sale, as well as how to keep washing and packing areas clean. Also, PBPT is required for anyone doing home based processing of any type as well as sampling at markets. Since I was scheduled to take my PBPT and All Samples training in Pikeville the following weekend, I grabbed another home baked cookie and some locally roasted Windy Hills coffee and headed out to enjoy the rest of the sunny January day. Bright and early the next Saturday morning, I headed south to the Pike County Extension Office for another day of learning and relationship building with the Pikeville Farmers Market team. While still a fairly young market, the Pikeville vendors are not afraid to do new and innovative things to grow their businesses. They might have fun with each other cutting up in their new pavilion right off Hwy 23 but, when it comes to why they are there it is to sell a quality product at a reasonable price to their friends and neighbors. Most of the business of this market is done by an elected board so, this meeting was strictly for training. Jackie Cole, Environmental Director from the Pike County Health Department started off the day talking about the requirements the health department has for selling ready to eat food at the market. The Pikeville Farmers’ Market has several vendors who sell hot meals, everything from BBQ, to Thai, to Cajun-style so this information, which isn’t usually on the roster for an eastern Kentucky farmers’ market, is necessary in Pikeville. Ready to eat meal vendors are permitted through the health department of each county. Typically, a food vendor who sets up at a carnival or festival can only get a permit for a few days and cannot be issued for that location again for six months. However, in Kentucky, a food vendor who sets up regularly at a farmers’ market can get a permit to sell for two days a week for eight consecutive months. 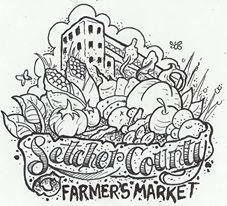 The vendor must pass the food handlers exam with a fee of $25 and then pay $100 for the extended farmers market permit. It is a relatively low charge with potentially high returns for both the vendor and the market. Yours truly got an opportunity to talk about Community Farm Alliance and how we support and advocate for family farmers across the state in Frankfort and provide assistance programs especially to markets like theirs through the Farmers’ Market Support Program. 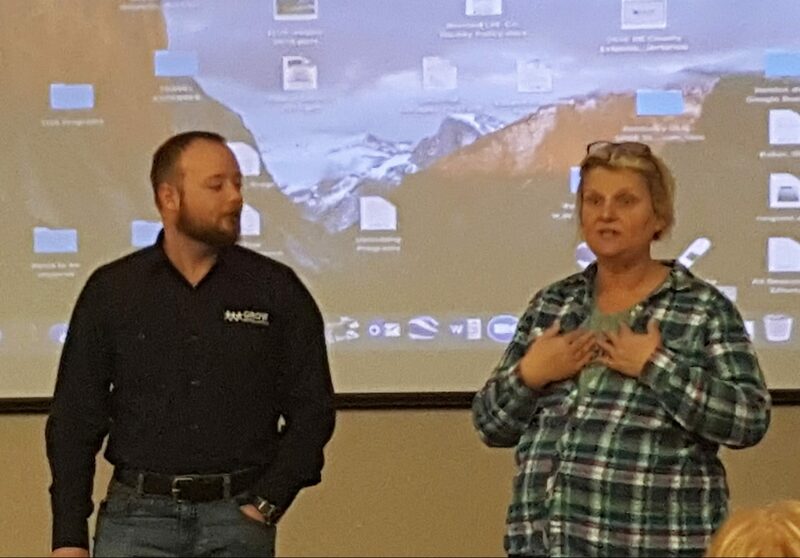 I invited them all to the Eastern Kentucky Farmer Conference which was being held the end of February and then passed the microphone to agriculture agent Suzanne Stumbo for the main event, the Produce Best Practices Training (PBPT). Soon we were engrossed in the PBPT lesson. Actually, I’m not joking. Maybe because I am not a farmer, but I hadn’t really thought about the science and health management that goes into growing food. Things like water sources, fencing and even the clothes a farmer wears into the field can have an effect on the final product. Let me just say, we don’t value our farmers enough for all they go through so we can eat safe, healthy food. The actual class took under two hours. For those of us who wanted the sampling certificate there was a test which would be graded. I found out earlier this week that if I missed any of the questions the Kentucky Department of Agriculture (KDA) would contact me to make sure I know the material before they will send out my certificate. Hopefully I will pass with flying colors. If not, I will take it again. Which reminds me, if you have already gotten your PBPT but didn’t do the sampling test and now you think it might be a good thing to have, you can go to KDA’s website, download it, take the test and mail it back in. It’s that simple. After a lunch of homemade chili and fudge, Melissa Bond from CEDIK gave a session on creating displays and marketing pointers for a table set up guaranteed to increase your sales. Since I was not a vendor, I grabbed another piece of fudge and left. Are you starting to see a pattern here? A week later, I headed to Letcher County for my third and final market training session, interestingly called: “Love 2 Farm Day”. If you think after two weeks, there would be nothing new to learn, you would be wrong. These three market trainings were as different as the markets they call home. The successful, nationally known City of Whitesburg/Letcher County Farmers’ Market began as a project of the Grow Appalachia program at Cowan Creek Community Center. Before becoming CFA’s Healthy Communities Initiative Director, Valerie Horn ran the Grow Appalachia program at Cowan. She will tell you that Grow Appalachia’s suggestion that families grow “a little extra to sell” became the impetus for starting a farmers’ market in nearby Whitesburg. So it was no surprise that the Love 2 Farm event was a mix of those two programs. And with Valerie’s style of teaching through interaction, it was full of food, fun and a little bit of paperwork. When I got there the pancakes and bacon were just being served (timing is everything) so, I grabbed some bacon and some coffee and found a seat. I’m not a big fan of maple syrup so I passed on the pancakes but later had to eat my words (with a little bit of maple syrup on them) when I took a small taste and found the syrup had a most delightful woodsy flavor. 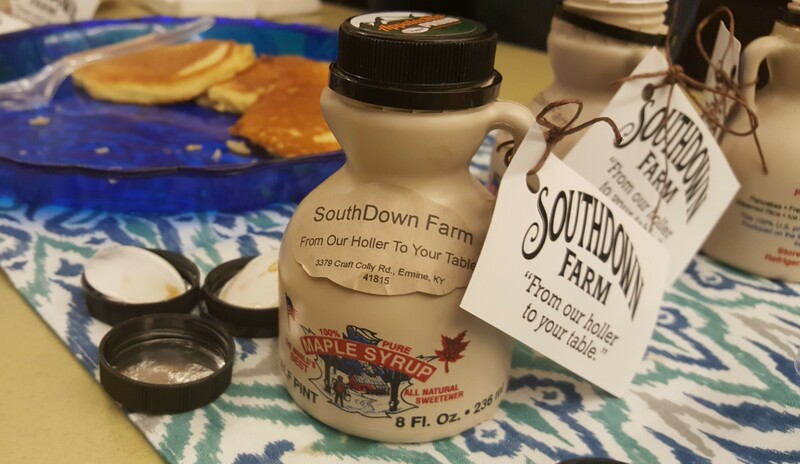 Try some SouthDown Farm maple syrup and find out what I mean. While we ate, Valerie told us what was happening in Whitesburg. Ends up there’s a lot. 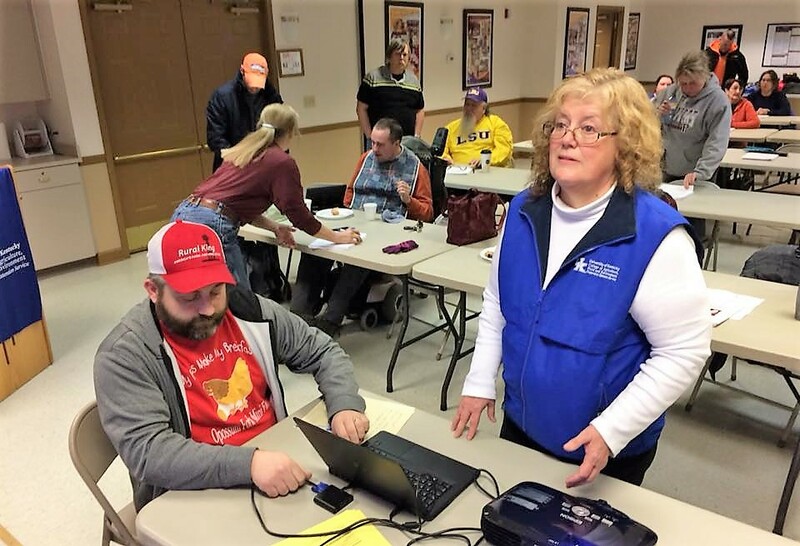 She talked about the UK walking program and the Farmacy program both of which add direct income into the pockets of farmers in and around Letcher County. She told us about the commercial kitchen in the old high school and that when it opened it would be providing ready to eat meals using produce purchased directly from Letcher County farmers. And then she started introducing her guest speakers. First up was Chris McKenzie from Grow Appalachia who talked about the new EKY DIGS program. DIGS (Direct Integrated Grower Support) is designed to bring one on one support to the small scale farmer in Eastern Kentucky. The program includes soil testing, on-farm consulting, an individualized production and more. Then came David Tyler who owns the Plant Place, a seasonal greenhouse where he grows vegetables, bedding plants,hanging baskets, “and much more!” All of his vegetable plants are seeded in house and his flyer says to ask him about his Turkey Creek tomato. David shared what he had available and ready to go in the ground and the different varieties his customers have requested for this year. It was a real pleasure to meet David and know that his small business was being so well supported by the community. If you are in Letcher County this spring stop by the greenhouse on HWY 3401 beside the Mountain Vendors Mall. Don’t worry if he’s open. Just pull up out front and he will see you “and come right out.” He lives next door. 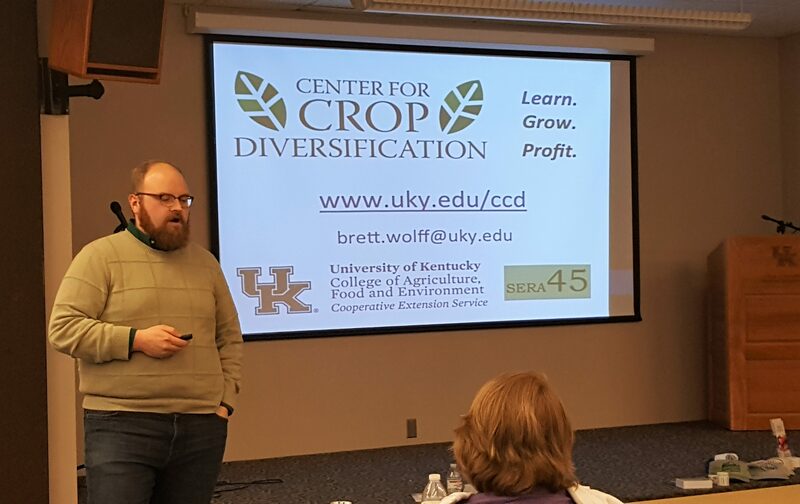 The pre-lunch presentations wrapped up with Brett Wolff from UK’s Center for Crop Diversification. He told us about what the Center does to help farmers set their prices and plan what they are going to grow. His office has several years of data about the availability and market price of most fruits and vegetables typically offered at Kentucky farmers’ markets. He has graphs that can tell you the high and low prices of tomatoes the last couple of years, when there were no beans at local farmers’ markets and when there was a glut and we even found out that it is Brett’s office that lists the suggested going rate on produce for farmers’ markets in Eastern Kentucky on their website every week. While standing in line for a lunch of soup, cheese, bread and cake, I figured out that an Eastern Kentucky farmer could have Chris come out to see what crops would do best on their farm, check in with Brett on when and how much to grow and then go to David to pick up the vegetable starts. After lunch, we separated into four groups for the last activity of the day: planning market events. Most successful farmers’ markets have more than good food. They invite the community to come and play too. The City of Whitesburg/Letcher County Farmers’ Market offers the summer feeding program for kids which is very popular. They also have lots of fun theme days which need to be planned in advance. To get a jump on that planning, Valerie added it right into her training sessions. Each group was given a page from a large calendar and told to plan special events for the months the market was open. My group got August, so we googled August holidays for some different ideas. We came up with International Underwear day—collecting new underwear for the school resource centers; Bad Poetry Day—with a “content appropriate” poetry slam at the market; and National Storybook Day where the vendors will dress as their favorite story book character. Needless to say, I will be sure to be in Whitesburg at least a couple days in August. I ended up breaking my pattern in Whitesburg by staying to the very end of the training (although I did get another piece of cake.) And as I headed home, thinking about these three planning/training opportunities for our eastern Kentucky farmers and farmers’ markets, I was excited about the diversity and uniqueness that each community celebrated in their markets. There is no such thing as one size fits all in Appalachia. From the multi-county vendor base in Perry County to Pikeville’s metropolitan atmosphere to fun and games on a Saturday in Whitesburg, each Eastern Kentucky farmers market has its own personality. As we work to build healthy and thriving communities in central Appalachia, I can’t help but think that small family farms and the farmers’ markets where they sell that are popping up like mushrooms on hillsides in spring are a real opportunity toward wholeness. Our farmers are dedicated to growing real food for us, our children and our grandchildren. We need to be dedicated to supporting their work. This market season, support your local farmers’ market and be glad to pay full price if you can. Farming is not a job. It is a vocation and we should honor those folks who grow our food with our praise, our thanks and our money. For more information on Grow Appalachia and UK’s Center for Crop Diversification, please visit their websites. You can find all of these farmers markets and David Tyler’s Plant Place on Facebook here.